No one plans on being injured at work. Most workers never give workers' compensation a thought until after they have been hurt or become sick. Then, on top of dealing with their injury and medical treatment, they are forced into a complicated legal system without the proper tools to guide them through. As a leading advocate for Pennsylvania working men and women, Willig, Williams & Davidson is committed to helping workers navigate the system, so they can focus on one thing – getting well. Our certified workers' compensation attorneys advise sick and injured workers of their legal rights, so they can maintain their dignity and get the treatment they deserve and 100 percent of the benefits required by law. 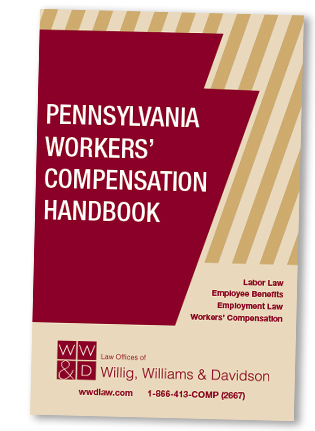 Check out our Pennsylvania Workers' Compensation Handbook for the most up to date information about the PA Workers' Compensation Act and what it means for you. To discuss a work injury or workers' compensation claim, call Willig, Williams & Davidson and our certified PA work injury lawyers at 1-866-413-COMP or 1-215-656-3600. Copyright © 2017 Willig, Williams & Davidson.